Mack Trucks recently named Steve Jugovic as regional vice president, Canada. 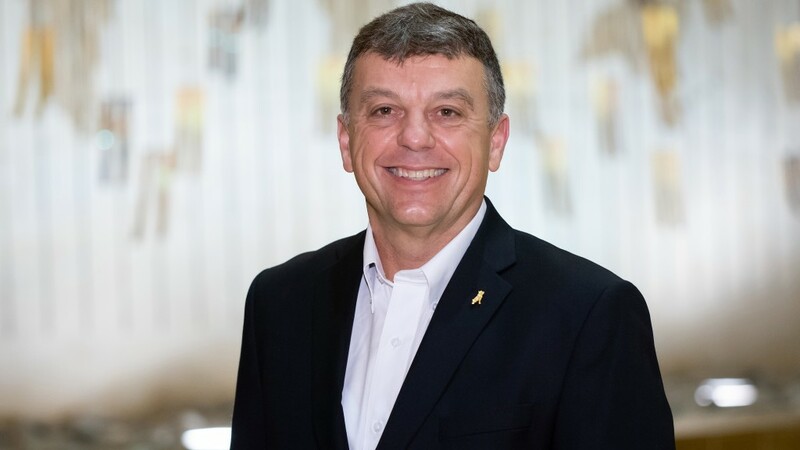 Mack Trucks recently named Steve Jugovic as regional vice president, Canada. Jugovic will be responsible for the end-to-end sales cycle for new business transactions, including dealer and fleet sales, full-service lease, rental and contact maintenance services. "Steve brings tremendous background and experience to this role," said Jonathan Randall, Mack Trucks senior vice president of North American sales and marketing. "We welcome Steve to our team, and we look forward to his contributions." Prior to joining Mack, Jugovic worked at Mack Financial Services Canada, where he led operations as managing director for nearly eight years. During his tenure, he built strong relationships with customers and dealers and helped to develop a high-performing Canadian team. Jugovic earned a bachelor's degree in economics from McMaster University, Hamilton, Ontario, a bachelor's degree in commerce from the University of Windsor, Windsor, Ontario, and an MBA from the University of Guelph in Guelph, Ontario. In open letters sent to the 20 largest municipalities in Ontario, the construction industry is urging City and Regional Councils to take more of a leadership role in encouraging the recycling of concrete and asphalt. DEUTZ brought its REVOLUTIONIZING POWER - High-Performance Advanced Drive Systems to the bauma trade fair in Munich in early April. For the first time, it presented a range of innovative drive systems for zero-carbon off-highway applications of tomorrow. The international leading manufacturer of engines for the off-highway sector is now able to offer individual combinations of diesel, gas, hydrogen, hybrid and electrified drives as part of a modular product system. Growth in most major markets helped Volvo Construction Equipment deliver a solid first financial quarter 2019, with sales up 15% and profitability up 26%. VMAC is pleased to announce that Mr. Rick Duifhuis has been appointed OEM Division Manager at VMAC. Mr. Duifhuis has been an important member of the VMAC team since 2005, managing several departments during his tenure, and has been working exclusively with VMAC's OEM partners for the past three years. EDGE Innovate has been honoured with a Queen's Award for Enterprise for International Trade. EDGE Innovate joins an elite group of organizations to be recognized with a prestigious Queen's Award for Enterprise. Now in it's 53rd year, the Queen's Awards for Enterprise is among the most prestigious business awards in the UK. EDGE Innovate has been awarded the Queen's Award for International Trade for Outstanding Short Term Growth in overseas sales over the last three years. Epiroc has appointed Jon Torpy as General Manager and President for Epiroc USA LLC, effective May 1, 2019. Mr. Torpy brings 15 years of broad leadership experience with Epiroc and predecessor Atlas Copco, and 20 years of overall industry experience. Allison Transmission Holdings Inc. has purchased Vantage Power and AxleTech's electric vehicle (EV) systems division. Allison Transmission has a more than 103-year history of leading technological advancements: from James Allison owning the winning race car of the Indianapolis 500 Mile Race in 1915 to building every transmission that is in the United States Army's Abrams Battle Tank. Allison is building upon the legacy of those and other advancements with an electrification strategy that leverages and extends current electric hybrid technologies, develops new electrified propulsion solutions, and expands system and integration level capabilities in alternative propulsion. BOMAG announces that it is partnering with Mont-St-Hilaire-based agent EDFA as its rental equipment line representative in the province of Quebec. As the new BOMAG manufacturer's representative, EDFA will work with independent and provincial rental outlets to make sure they have the right mix of BOMAG compaction equipment in their rental fleets to support their customers. dynaCERT Inc. has received a new order for its C-Series of HydraGEN Technology products in the war against NOx and Greenhouse Gas Emissions with its made-in-Ontario Carbon Emission Reduction Technology. Generator manufacturer Generac has introduced web-based training that offers customers the chance to learn more about the basics of generators and generating equipment. A total of 120 exhibits, including 18 world premieres and 25 innovations as well as six interactive technology demos: the Wirtgen Group's booth at Bauma was packed with leading machine and application technologies from Wirtgen, Vögele, Hamm, Kleemann, Benninghoven, and John Deere. Hendrickson is expanding their Trailer Commercial Vehicle Systems operations in northeastern Ohio. 35 acres were purchased from the more than 325-acre parcel of the Stark County Farm property. This new 35-acre plot will be home to Hendrickson's sixth trailer suspension plant. CASE Construction Equipment has awarded the $25,000 Dire States Equipment Grant to Chapin, South Carolina for the East Chapin Sewer Force Main Project. The project will install a new parallel force main to relieve pressures in the service area on the existing sewer force main and pump stations. The additional force main will provide capacity to reroute sewer flow to significantly reduce the likelihood of future overflows that may affect the drinking water of approximately 130,000 drinking water customers in area. Doosan Infracore North America, LLC, has announced its top-performing equipment dealerships of 2018. These Doosan dealer enterprises have demonstrated a high quality of customer service to provide exceptional sales, parts and services to their customers, scoring well on their annual dealer performance reviews. Ritchie Bros. has announced organizational realignment in North America , which will include a focus on three key business areas. The changes will come with several personnel changes in certain positions. Nortrax announces that Richard Perzan will be joining the Nortrax leadership team in a newly created position as General Manager Roadbuilding and Minerals. Reporting to Perzan will be the addition of two newly hired Wirtgen Group Territory Managers, Ryan Link and Dave Notari. Perzan will lead his team as well as help facilitate the sales department with complete responsibility for all activities related to Wirtgen, Hamm, Kleemann and Vogele product groups. PacLease Edmonton Kenworth (Alberta) has been named the PacLease 2018 North American Franchise of the Year. The honour was presented at the annual PacLease awards dinner held in conjunction with TRALA's annual meeting in Orlando, Florida. The City of Toronto is poised to restrict concrete work for the construction of high-rise buildings through amendments to the noise bylaw in a move that will threaten more than 7,000 jobs and cripple the industry's ability to deliver much needed housing supply to Torontonians. PRECO Electronics is exhibiting at bauma 2019. The PRINOTH PANTHER T7R is set to redefine the standards for tracked dumper productivity & cost effectiveness, and so we are proud to add this remarkable new vehicle to an already impressive product offering. With its design & engineering guided from the ground up by those who know our vehicles best: our customers - the PANTHER T7R goes well beyond technological innovation,delivering both lower cost of ownership and the ability to get the job done. The Liebherr Group notched up a turnover of € 10,551 million in 2018, breaking through the € 10 billion barrier for the first time in the company's history. This represents an increase of € 739 million, or 7.5 percent, compared with the previous year. The Mobile Fabrication technology of Max Bögl Wind AG won this year's bauma Innovation Award in the construction method category. The world's most unique production concept for Hybrid Towers won over the jury for its technical innovation and contribution to climate protection and resource efficiency. SNC-Lavalin has reached an agreement to sell 10.01% of the shares of 407 International Inc., the world's first all-electronic, barrier-free toll highway located in the Greater Toronto Area, to OMERS. CASE Construction Equipment celebrated 50 years of skid steer manufacturing with a ceremony on Wednesday, April 3rd at its Wichita, Kansas plant. CASE first built skid steers in 1969 at its Burlington, Iowa facility, before eventually moving production to Wichita. The Volvo Group's Hagerstown powertrain manufacturing facility received $1,180,400 in rebate incentives from Potomac Edison for a number of energy efficiency upgrades made at the site since 2016, which has saved the equivalent of 9,158,862 kilowatt-hours of electricity, enough to power 759 average homes for a full year. Case Construction Equipment dealer ASCO recently provided a TR310 compact track loader and CX130D excavator to disaster recovery nonprofits Team Rubicon and project leader SBP. The equipment was used for demolition work before SBP could rebuild a Houston home that first was burnt to the ground then flooded during Hurricane Harvey. The BC Construction Association (BCCA) and industry partners launched BC Construction Month with the release of key construction sector statistics and the results of a province-wide survey that highlight the value of the sector to the provincial economy and the key issues facing employers and workers. In an effort to address bullying, hazing and harassment on B.C. construction worksites, the BC Construction Association (BCCA) and its Builders Code partners celebrated the start of BC Construction Month with the launch of a humourous province-wide campaign that tells worksite offenders, "Don't be a tool." A new John Deere low monthly payment lease program is available for customers seeking financial flexibility when acquiring select models of John Deere compact track loaders and skid steer loaders. The 314G and 318G skid steers, and the 317G compact track loader models are offered within the new program. Big crowds of heavy equipment professionals filled the halls of Mississauga's International Centre for the 2019 edition of the National Heavy Equipment Show, which took place Thursday, March 28 and Friday, March 29. More than two years ahead of schedule, Volvo CE has achieved its end of 2020 WWF Climate Savers commitment, aimed at reducing the amount of energy the company produces in its plants. Effective immediately, Doosan Bobcat North America will transition its rights to the U.S. sales, marketing and service of the Montabert brand of attachments to Montabert SAS, creating a direct link between the brand's U.S. distribution network and factory in Lyon, France. This change is the result of an agreement reached jointly by both parties to support Montabert SAS's desire to get closer to its U.S. customer base. PipeLine Machinery International (PLM) announces the retirement of Gerald (Gerry) Grothe effective April 1, 2019. Terex Trucks, the Scottish articulated hauler manufacturer, has big plans for North America. The company wants to expand its already 35-strong North American dealer network, bringing its TA300 and TA400 machines to even more customers throughout the region. Schneider Electric has announced that they have signed a Memorandum of Understanding with the Kami Mine Limited Partnership to lease or purchase equipment from Schneider Electric for use in the Kami Iron Ore Project, located in western Labrador, Canada. Bomag has announced that Construction Equipment Solutions (CES) is a new rental equipment industry distributor for the provinces of Ontario and Newfoundland & Labrador. As a new Bomag rental distributor, CES will offer independent and national rental outlets sales and parts support for Bomag's extensive line of rental compaction equipment from its Pickering, Ontario, headquarters. The Manitou Group is working with the NEOLINE maritime project with intent to transport its machines to the American market. This future innovative and environmentally responsible cargo line is part of the Group's corporate social responsibility approach.